Glass pliers are used to break glass apart after cutting, some pliers can also shape cut glass pieces. Pliers come in many shapes and sizes: breaking pliers, running pliers, grozing pliers, combination breaking and grozing pliers, from cheap to expensive. Each of these types of pliers can be used to complete the cutting process. Pliers are are one of the most used glassworking tools, many artists have a large variety of pliers, others have one or two. An online search will show you the many styles available and their uses. The general purpose of pliers is to assist in separating fusing glass after scoring by a cutter With long straight scores some people snap the glass by hand, others much prefer to use pliers. Where the score is short, close to the edge or curved, pliers can be the best option. The most multi function of the pliers are grozing pliers. Grozing Pliers are similar to breaking pliers, but one or both jaws are curved and both jaws are serrated. If the pliers have one flat jaw then they can be used as breaking pliers with the flat jaw facing up. Grozing pliers are also used to nip away small pieces of glass from a cut piece. They are very handy for shaping corners and other design features on glass jewelry pieces prior to fusing in a glass kiln. Breaking Pliers with two flat jaws produce a break that is very straight, providing the glass has been scored correctly. Some breaking pliers have wide jaws whilst others gave narrow jaws. Narrow jaw pliers are very handy in breaking glass where there is a very small area involved that is too small to hold securely. Also very handy in breaking out small curved pieces. Running Pliers come in a variety of styles and materials, these pliers break the glass by applying equal pressure on both sides of a score. These pliers are quite often adjustable, with special protective pieces covering the jaws. Used on any glass that requires a little more pressure to break especially thicker pieces. Cheaper plastic pliers may not produce the same result on thicker pieces of glass and can only be used to run straight scores. More expensive steel or aluminum pliers can be used to break out an inside curve. 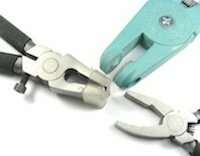 A range of Breaker/ Grozer Pliers are available from Delphi Glass.